Hello all, and welcome back to my “Open-Face Chinese No Mercy Little Guide”! 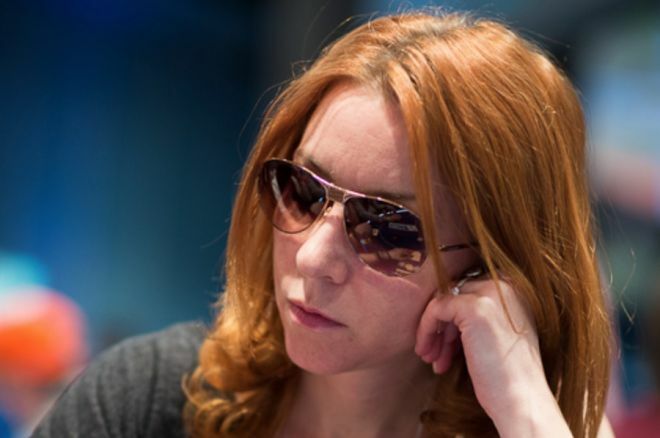 Following our overview of OFC’s history and discussion of rules and variants, we’ve now moved into discussing various primary recommendations for elevating your game as well as analyzing tricky scenarios that occasionally arise in OFC Pineapple. Let’s continue what we were doing last week and analyze a second complete hand of OFC Pineapple so we can cover different points all at once. 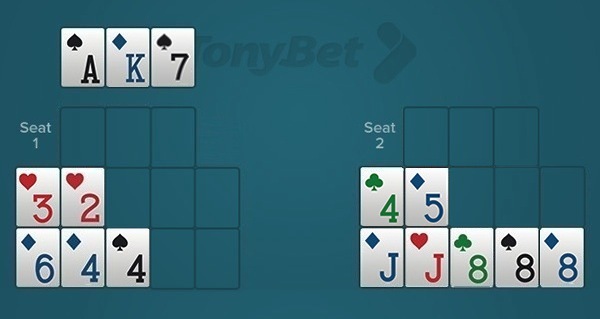 This is a hand I played last week in the “No Mercy Ride” tournament on TonyBet Poker, one that came up while we were heads-up at the final table. My opponent was taking a lot of risks, fouling two hands out of three, and he was always going for queens, kings, or aces on top, no matter where we were in the hand or what he had to back it up. I have learned by now that you have to be quite aggressive to win in OFC, and you have to play with the cards that are dealt to you. But in this particular scenario, I thought the best strategy was to be more conservative — basically playing the opposite style of my opponent! When deciding how to place my cards, I noticed the already showing in my opponent’s hand, but I still chose to position my pair of fours in the back along with my six, leaving the door open for an eventual full house in the back. 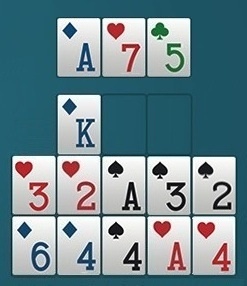 Meanwhile in the middle I could complete either a flush or a straight. As I discussed in a previous article, I’m not a fan of going for the gutshot straight draw in the back — which in this case would have meant placing 2-3-4-6 there and drawing to a five. Even though all of the fives are live, for me this feels like going all-in in a regular hold’em game. Moreover, my four in the middle would be almost dead, considering that there’s only one left in the deck. 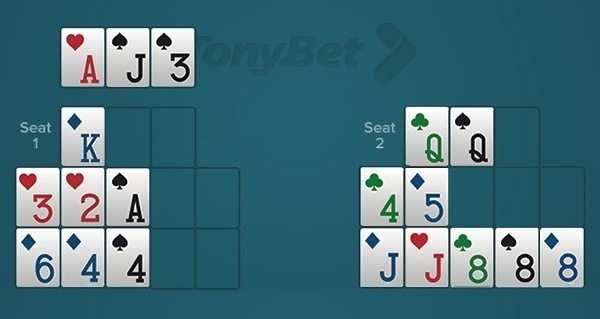 Those three cards are all absolutely live — something that doesn’t occur so often on the second draw in OFC — so for me this is an easy play, going with the ace in the middle and the King on top, aiming to get to Fantasyland. I went with that, then my opponent placed two queens on top on the very next draw! This was a surprising play to me, as he put himself in big danger of busting out at this point of the hand. He was risking losing his 6 points for the full house bonus, and he knew three of his remaining fours were already dead. I had to wonder — what did he expect to make in the middle to survive this? Trip fives? A long shot straight while I am showing a deuce, trey, and six? A pair of fives along with another surprise pair he will catch? Personally, I am not a fan of this play, but then again, I am learning every day and I might be wrong on this one. In any case, as I’ve already pointed out, this was not entirely shocking, as my opponent had been making these kinds of moves hand after hand. And I kind of liked it! After all, it made my decisions much easier seeing him fouling all the time — lol! In a regular situation, I would go for a pair of aces in the middle, knowing that all my sixes and kings remain live and placing me in an excellent spot to go to Fantasyland. Now I wouldn’t go for two pair (aces and treys) in the middle, as this would be too difficult to cover in the back, knowing only one four is live and that making sixes and fours in the back wouldn’t do the job. So I would place my ace in the middle along with the jack (as two of those are out already), and I want to keep my top line open should I catch the two remaining queens. Meanwhile I’d be wary of the remaining two aces, as these could not be placed on top since the king-kicker would be higher than the jack-kicker in the middle. But in this particular situation — against this particular opponent’s hand — my decision-making was very much influenced by the fact that my opponent had almost no way out of his hand. Therefore, instead of taking the risk of fouling as well, I decided to play conservatively and placed only the in the middle, the pair of treys already being beaten by my pair of fours in the back. As for the other card, because I had oriented myself toward a very secure play, I positioned the in the back as it was more live than the jack. It’s a safe play, but I could still make it to Fantasyland. Had I not been influenced by my opponent’s risky play, I would have gone for the ace in the middle on the previous draw, and now would have been all set to go to Fantasyland by placing the in the back and the on top! Well, what’s done is done, and so I faced multiple choices yet again. Indeed, here I could place my king on top, trying to go to Fantasyland and beat my opponent’s queens at the same time (assuming he doesn’t make trip queens while catching his six). That would mean placing either a four in the back for trips or a deuce in the middle for two pairs. Analyzing my outs, it turns out that I would have five live cards in the back to avoid fouling (three sixes and two aces) and six live cards in the middle (two treys, two deuces, and two aces). 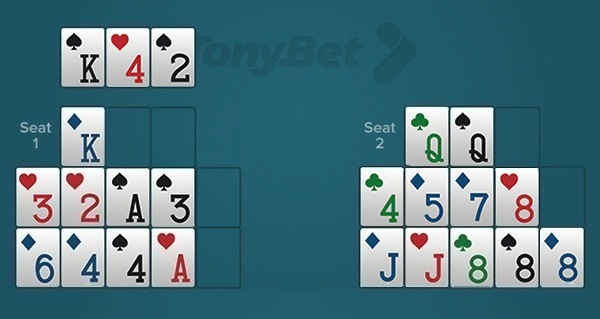 Therefore, in this scenario, the best play would be to go with the four in the back. However, still being very much influenced by my opponent’s suicidal position, I decided to follow my initial conservative strategy by protecting myself from busting out at all costs. Indeed, I went with a super chicken play, placing the in the back, the in the middle, and throwing the king away even while realizing I would lose all three lines and pay big time if my opponent caught his six on the last draw. Again, I’m really not sure this is the right play, but it somehow paid out, as my opponent did ultimately foul his hand, making only a pair of sevens in the middle. As for me, the irony is that I did catch an ace on the last draw, which made me scream again — this was my second opportunity to go to Fantasyland in the very same hand! Indeed, if I had placed my king on top and the four in back, there was my magic ace to make two pair in the middle. It’s a huge difference. Should I have gone for it at my first or second opportunity to go to Fantasyland, in both cases I would have made 8 bonus points for my kings on top, plus 6 points for the lines and scooping, for a total of 14 points. Not to mention I was going to Fantasyland! Instead, I only cashed in for 6 points. Even so, in the end sticking with this conservative style for an hour’s worth of heads-up proved worthwhile, as I did beat my opponent and I won the tourney! Rendez-vous next week for more of my “OFC No Mercy Little Guide”! Start playing OFC today by downloading Tonybet Poker and using the bonus code NOMERCY to receive 100% bonus up to €500 and a free ticket for a weekly Pineapple NoMercy Ride tournament!